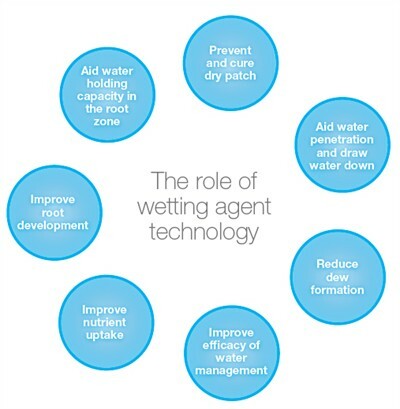 The role of wetting agents has, until now, primarily been to prevent and cure dry patch or to move water through the soil surface and into the root zone. However, with water an increasingly important resource, wetting agents are taking on new roles to improve water conservation, turf health and overall turf quality that can enhance the playing experience. Wetting agents have traditionally had two very clear and distinct functions - to move water away from the surface or to retain water in the soil profile. 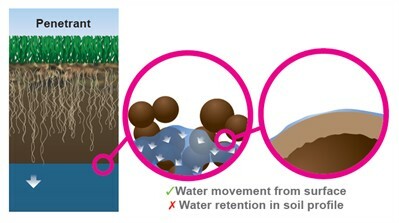 Penetrants move water down from the surface through the soil profile; polymers hold water within the soil profile. The chemistry of wetting agent technology - and the clearly different purpose for each component - makes it physically impossible for any single penetrant or polymer to fulfil both roles. Penetrant wetting agents effectively work by making water wetter! It means each water droplet spreads more easily and can penetrate soils more readily. This helps water move through the surface layer and helps keep the surface dry. Water moves freely down the soil profile, but is not significantly held in root zone. If you've witnessed how water balls up on the waxy surface of a freshly polished car bonnet, that's what is happening with water that sits on a hydrophobic surface in larger droplets and it cannot penetrate into the soil (below). When you break the surface tension of the droplets, they spread far more thinly and the water can work its way into the soil profile. To break the surface tension effectively penetrants need to be small molecules that move fast within water droplets. They also need to be able to pack tightly at the surface of the liquid to break surface tension and help the water spread (the term surfactant means surface active agent). It is impossible for large polymer structures to move as fast and pack the water surface layer so tightly in this way - which limits the potential for any pure polymer wetting agent to help with penetration. 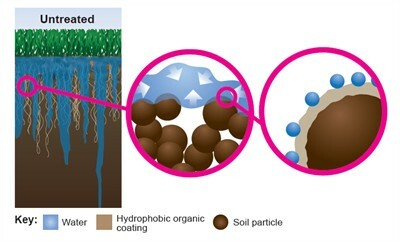 Penetrants are important not only to keep the surface as dry as possible after an irrigation event, but are essential to get water into the soil profile of areas that have become hydrophobic - where a 'waxy coating' that physically repels water has been laid down on the surface of soil particles. You may think you've irrigated evenly across the green, but where hydrophobic areas prevent penetration of the water, it either sits on the surface or runs off to a non-hydrophobic low spot and infiltrates there. The result is some plants getting little or no water and suffering accordingly, whilst other areas are over saturated - leading to soft spots and inconsistent putting surfaces. The fast, highly active action of penetrants does mean they are typically shorter lived, so you may need to re-apply them more often. What is the role of polymers? Polymers, sometimes referred to as block co-polymers, are far larger molecules that effectively bond water molecules onto soil particles and can therefore hold more moisture in the profile that would otherwise dry out quicker. Polymers are the essential component for retaining soil moisture in the profile. 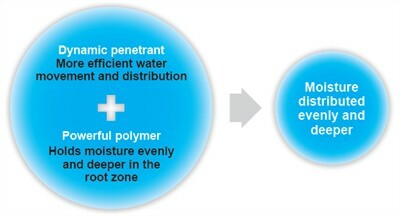 However, these larger polymer molecules are essentially ineffective as penetrants, since they move slowly within the water droplet and cannot physically cluster together at the water surface layer to break the surface tension, in the same way that a penetrant can. Water movement and flow through the soil is still restricted by surface tension and water often held in upper profile. If your sole intention is to move water away from the surface and you don't have any concerns about Dry Patch or retaining water in the soil profile, then a straight penetrant would be the best choice. 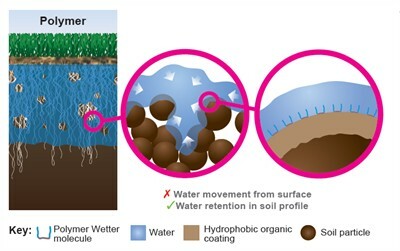 If you are looking to retain soil moisture to improve the efficiency of water resources and optimise plant health, the polymers are the product of choice. However, polymers on their own are limited in efficacy in getting water to where it's required, and holding it consistently and evenly in the soil profile. With Qualibra the wetting agent components of both penetrant and polymerare combined and act in a complimentary way - with the penetrant helping to give a more even distribution of the polymer through the soil profile, which in turn enables it to hold soil moisture where it can be better utilised by turf roots. As an effective water conservation agent, it holds soil moisture deep and evenly. Healthy roots grow more vigorously where there is soil moisture present. As a benchmark, Qualibra contains the optimum balance of its selected components, with around 10% high performance penetrant and 90% water conservation polymer. The combined action also ensures the wetting agent is better distributed in hydrophobic-prone soils, which alleviates problems where they exist and is highly effective in preventing Dry Patch occurring. Furthermore, the penetrant fraction delivers the water movement from the playing surface, which ensures it stays firm and playable, but also prevents soil becoming too wet and saturated. Trials have shown that Qualibra is more effective in getting soils back to optimum soil moisture and with significantly less irrigation than other wetting agents tested, but avoids holding too much water that could adversely affect turf health or playability. It's important to remember that wetting agents won't change the fundamental structure of soil or cure underlying problems simply by their application. It is therefore essential that you still undertake the essential aeration and organic matter management, and aim to avoid compaction, that will make the soils as conducive as possible for surface drainage, soil moisture retention and root development.